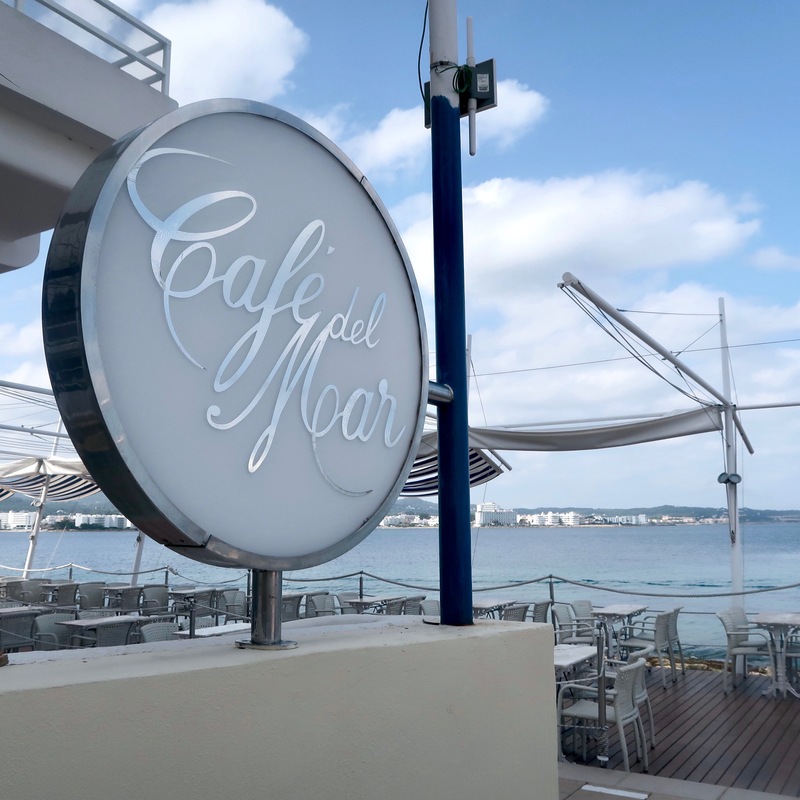 Home Travel Where’s good to eat in San Antonio, Ibiza? 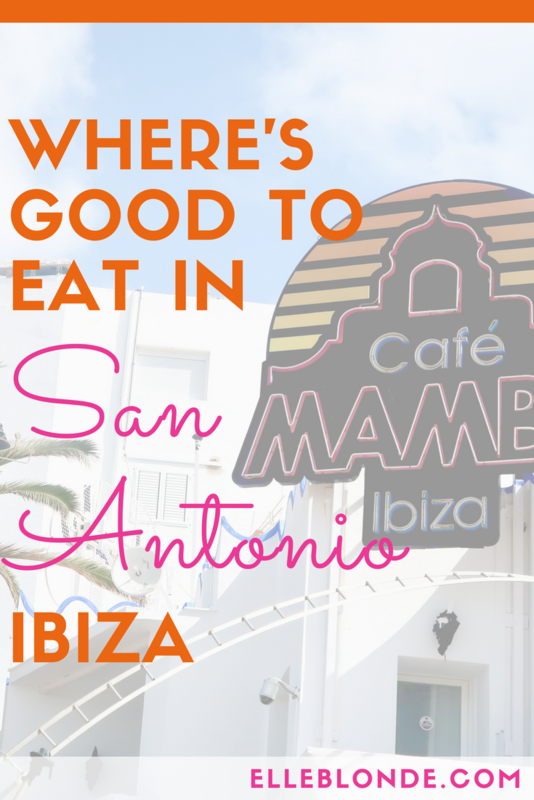 Where’s good to eat in San Antonio, Ibiza? San Antonio, a place that fondly captured my heart firstly in 2011 and again in 2017. Once more it’s captured my heart when I returned in April this year. A haven for electro dance, a gorgeous destination to rave until the early hours and a home to some of the globe’s best club nights. Since 2011 and my visit San Antonio has smartened up its appearance and changed its demographic. Once attracting yobs and those causing carnage. 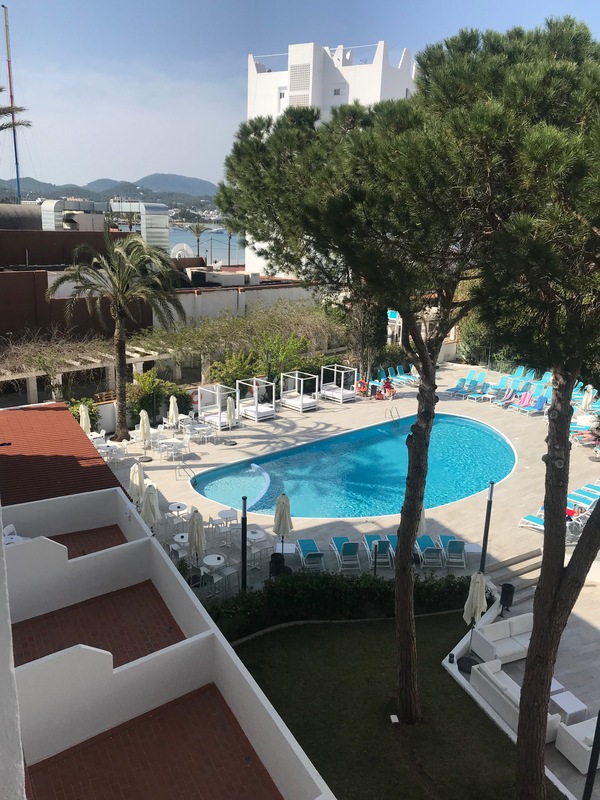 It has quickly become a Marbella rival and now sports boutique hotels, swanky day clubs and has that beautiful people vibe. You’ll even find a yoga retreat or two on the island. Having decided we weren’t destined to spend the remainder of our trip in Portinatx. 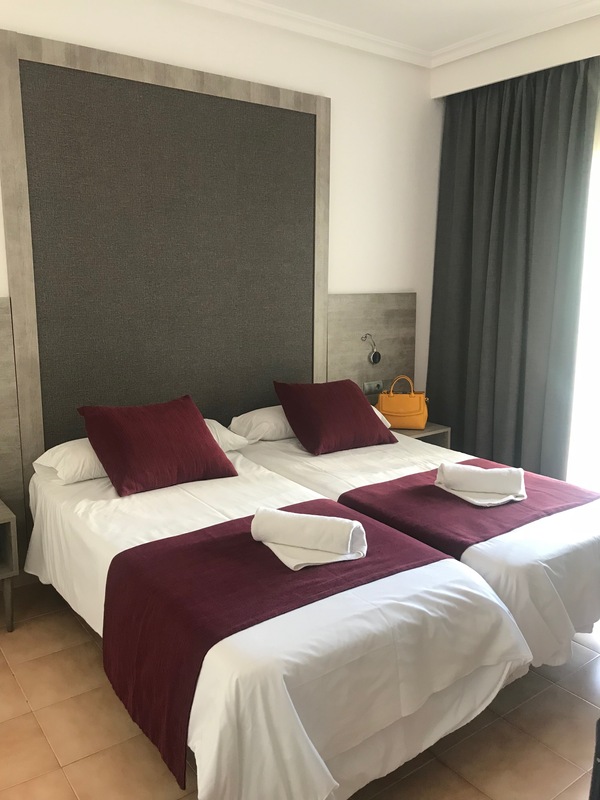 We booked the Hotel Marco Polo I which is located seconds from the beach, just behind Eden. Booking our room we headed by bus from Portinaxt to San Antonio (catching the 20A (€2.95) to Ibiza Town. Then the 3 from Ibiza Town to San An for €2). The journey took just short of an hour and had beautiful scenery the whole way. With the island being pretty small the bus service is excellent. Especially as personally I find taxis in Ibiza to be relatively high in price (our taxi from the airport to Portinaxt cost around €45). Arriving at Hotel Marco Polo I, already I knew this was more our vibe. We headed to our room after check-in (we were able to go to our room early) and as soon as the door swung open I let out a sigh of relief! White walls and that grey wash flooring. This boutique modern room was simple yet just what we needed! The pool was small yet buzzing with people, especially as it was so off-season. Heading down and grabbing a cabana we soaked in the party atmosphere. 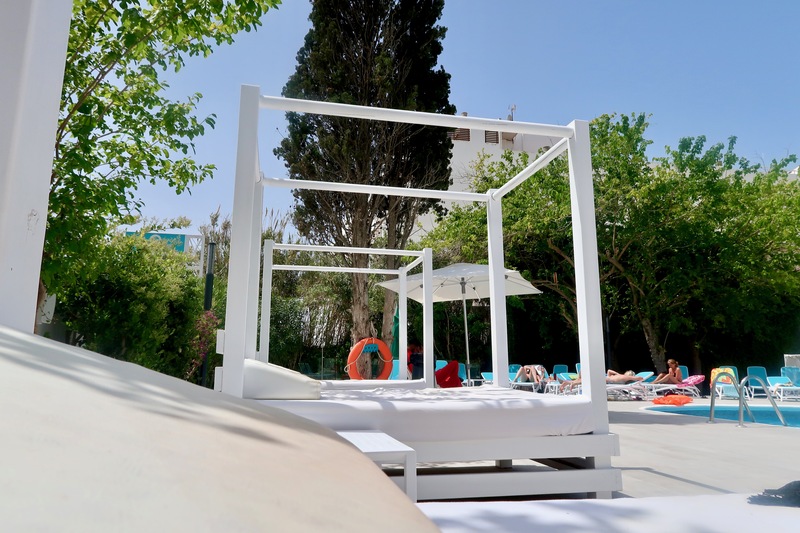 With pool and ping pong, cosy sofas and a snack bar serving an array of drinks we settled right in. Admittedly this booking was a steal as we only paid around £50 for the night which included breakfast. Which boasted a huge selection of both cooked and continental choices. One of my better finds on Booking.com and well worth staying in when in San Antonio. Lunch was a fantastic find, we stopped at Leopard on the front – just opposite from Santander. Whilst we sunned ourselves a little more and indulged in one of my favourite past times, people watching. 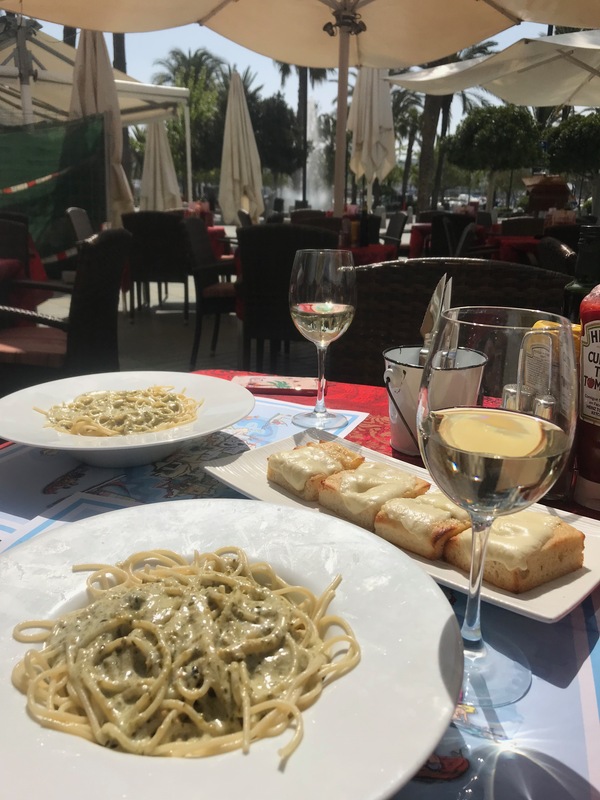 We both selected the spaghetti with pesto (€9.50) and quaffed on a bottle of crisp white wine (€15.50). The food, cooked fresh was delicious and a great portion size, and the wine, well it was that great we had another bottle. The staff were exceptionally friendly and the views onto the marina are stunning. If you’re looking for somewhere to eat in San Antonio, this is it! We also ate at Itachi Beach Club. Which is another bar belonging to Ocean Beach. It was their first day open and the whole of that strip along from Ocean Beach and Ibiza Rocks Bar was closed. Heading in we chose a mojito and a Ibiza Dream. They do have good drinks offers on too so well worth heading there for reasonably priced alcoholic drinks. With an upstairs open terrace and seating outside this bar has the scope for so much this Summer. Great views and friendly staff. 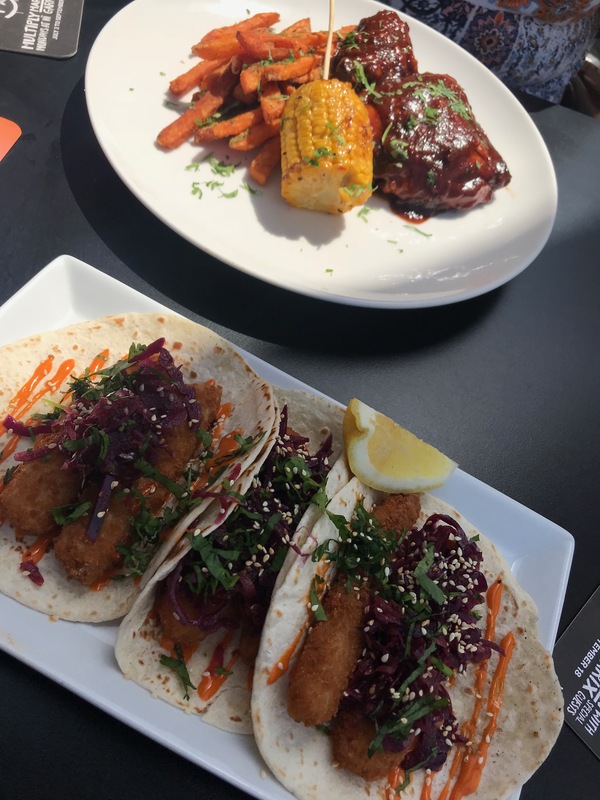 We had the Jerk Chicken and the Fish Tacos which had been freshly cooked and were a high standard. Again the atmosphere was relaxing and enjoyable and made a great place for people watching too. 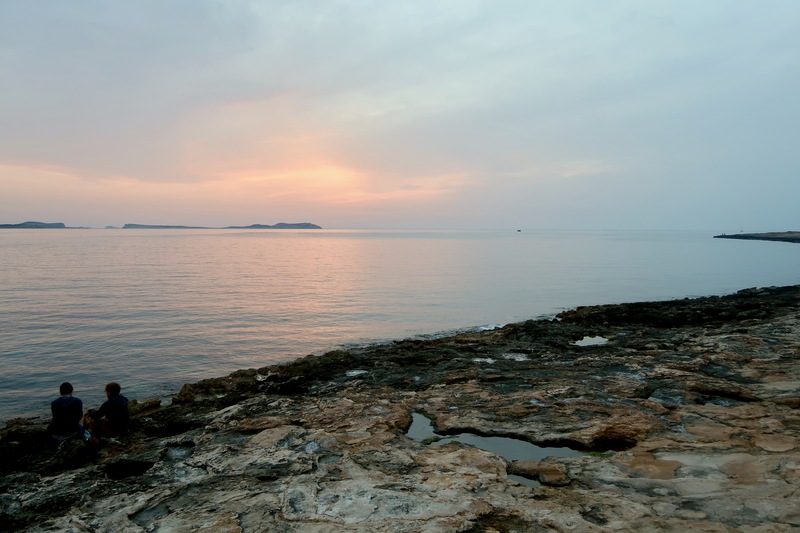 Of course, no trip is complete without watching the famous sunset outside of Cafe Del Mar or Cafe Mambo. Both have a great summer line up of DJs playing nightly to help make that sunset even more relaxing and enjoyable. You can find the lineups for both Del Mar and Mambos here. Admittedly, we had been informed that it was a pretty gruesome winter and we hadn’t expected much from the sunset. It was pretty rubbish. However, don’t let this damp squib deter you, as I have witnessed some pretty spectacular sunsets previously. If you’re looking for somewhere to eat along Sunset Strip I do recommend Mint Lounge. Fortunately, we didn’t have to make a reservation given the time of the year. I do however recommend booking in advance of your trip. We both had a soft drink to begin, just a little tip. Water in Ibiza is an outrageous price (€2.50) for a small bottle and don’t try and ask for tap water as they can’t serve this due to the health risks. We then moved onto cocktails we had a Raspberry cocktail and a mojito and to eat we shared the Popcorn Chicken which was a huge portion size and perfect as a sharer. Followed by the Calzone (€17) and the Lobster and Prosecco Risotto (€17). 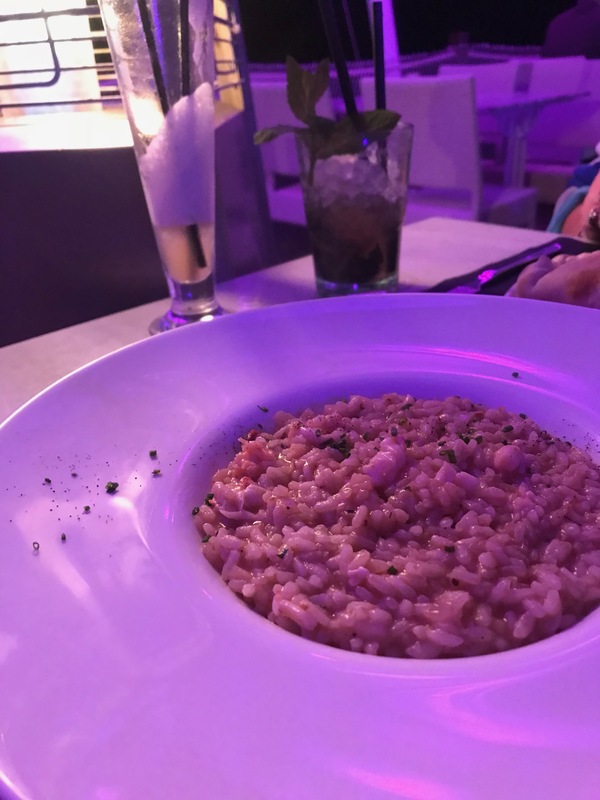 The risotto was absolutely sensational and easily the best meal I enjoyed on this trip to Ibiza. With meaty pieces of fresh lobster, it was rich and decadent without being too overbearing. It was a dish that pretty much appealed to all of my senses. I’d certainly have it again when I return. It was a little breezy and the sea, as it always is, was a little strong smelling. However, don’t let that dissuade you from enjoying your dinner in one of the biggest bucket list spots in the world. Getting the bus to the Airport. We decided to get the bus back to the airport as we do enjoy an adventure. Do check the bus timetables (there’s a handy app you can download here). 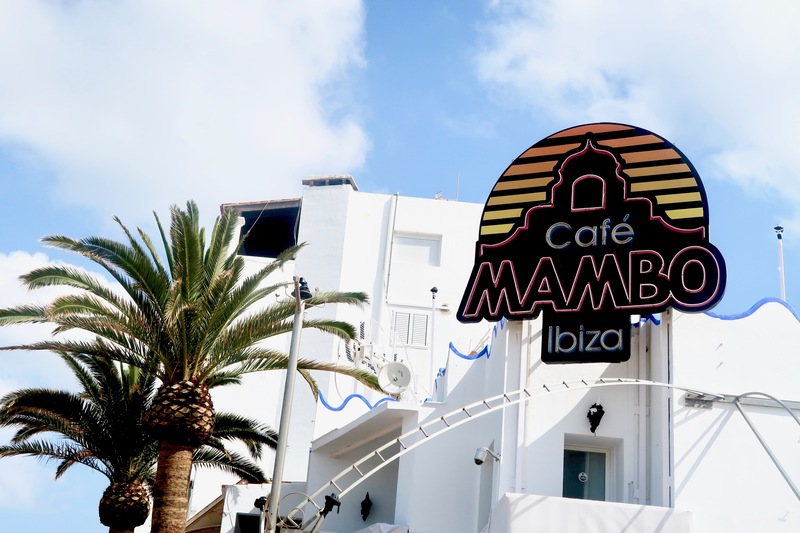 The bus depot is literally a 2-minute walk from the front and is the pickup and drop off point for the Discobus which takes you to the likes of Ushuaia, Sankys, Ibiza Rocks and Amnesia. The bus we got was the 3 (€2) into Ibiza town then the 10 (€3.50) to the airport. If you’re heading there in the Summer you can hop straight on the 9 (€) which will take you directly from San Antonio to the Airport.